I’ve had several requests for information about herbs, so here it is! Basil is one of the most popular herbs to grow-there is nothing better than cooking with fresh basil! For earliest basil production, start seeds indoors 6 weeks before the last frost date. Harden off, then transplant the week of the last frost date. If you’re not in a big hurry, just wait until the week of the frost date to plant outside. Harvest leaves as you need them, leaving about 4 per stem. Be sure to pinch off the growing tips, since this promotes more bushy side-growth. One of the biggest benefits of basil that I have experienced–aphids don’t like it. So, I plant one in every square foot of lettuce and next to my tomatoes. If you’re growing them as “helpers”, squeeze them in anywhere (like the middle of 4 lettuce plants, or the edges of tomatoes). If you want to dedicate an entire square to basil just plant 1 per square. I’ve personally never grown chives, but here is what I researched. Start seeds indoors 10 weeks before the last frost date. Harden off, then transplant the week of the frost date. Or, plant outside the week of the frost date. Warning–chives take about 3 weeks to germinate, so it will be a while until you can harvest them if you start outside. You can also buy chive transplants. Plant 9 per square. Harvest by cutting up to 1/3 off the ends after they reach 6″ tall. Chives are a perennial plant, and will multiply. You’ll need to divide them every 2-3 years. Personally, I think there is nothing better than fresh salsa with cilantro! I’ve gotten mixed reviews about starting cilantro indoors, but since some sources say you can, I say go for it! Start seeds indoors in peat pots 6 weeks before the last frost date. Harden off, then transplant the week of the last frost date–be careful not to disturb the roots. You can also plant them outside the week of the frost date. Plant 4 or 9 per square. Harvest leaves anytime after they reach 6″ tall. My experience is that cilantro will bolt (flower and go to seed) when it gets hot. So if you can, choose a partially shaded spot for this herb. I developed a love for dill when I lived for a short time in Eastern Europe. I know it’s not such a popular American herb (with the exception of using it for pickling), but I love to cook with dill! Again, my sources do not suggest starting dill inside. But I have for two years, and it’s been very successful! Start indoors 6 weeks before the last frost date. Harden off, then transplant the week of the last frost date. Or, plant outside the week of the last frost date. Plant 1 per square. Harvest leaves before the flowers appear, and store them in the fridge in a cup with a little water. Or, you can freeze it. If you want to use the seeds, wait until the lower part of a seed cluster is ripe. Dill can grow rather tall, so you may need to support it if your garden is subject to a lot of wind. Plant garlic bulbs in the fall, during October and November. You can purchase garlic through a catalog, or just use some from the grocery store. Plant the largest bulbs pointy side up, 1-3 inches below the surface. Plant 4-9 per square. Harvest in the summer after tops have fallen over, but before they have dried out. Mint is a weed. Okay, not technically but it spreads and grows like a weed. For this reason, I do not suggest planting mint in the garden. Either keep it in a pot, or in a contained section of a flower bed. Buy a transplant, or get a little start from a friend or neighbor. Plant it, and away it will go! It will send out runners and spread relatively quickly. To harvest, cut back a stem to 2 leaves. Start seeds indoors 6 weeks before the last frost date. Harden off, then transplant the week of the last frost date. If you’re not in a big hurry, just wait until the week of the frost date to plant outside. Plant 1 per square. Harvest leaves as you need them, leaving about 2 per stem. Start seeds indoors 10 weeks before the last frost date. Harden off, then transplant the week of the frost date. Plant 1 per square. Start seeds indoors 6 weeks before the last frost date. Harden off, then transplant the week of the last frost date. Plant 1 per square. 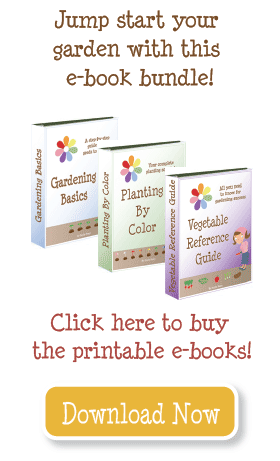 Alicia–If you are growing basil to harvest it, one per square. It will get that bit. But if you’re just growing it for bug protection, one in the middle of 4 leaf lettuce plants will be fine. Just pinch off the leaves to keep it small. By the time the lettuce is big enough to crowd it out, it’s usually strong enough to withstand pests (or it’s ready to harvest). I’m a bit confused with the directions about basil. From everything I have read it looks like only one basil plant is recommended per square foot. But you mentioned squeezing it in with 4 lettuce plants per square foot. Can you clarify this? I am planting a bed of lettuce, so putting basil in there for insect control sounds good, but I’m not sure how well everything will grow squeezed in together? I am in Southern Oregon in the yellow group. Thanks for the help. I amend the bed well in the spots where I plant, then work around it in the spring. I have a question about planting garlic. If I plan to plant it in the fall, how do I deal with my bed? Do I want to rotate the soil in the fall then before I plant the garlic? Or do I rotate the soil in the spring and try to keep away from the garlic? This is my first year gardening, so I am not even sure what to do with the bed to prepare it for winter. I don’t know where you live and how hot it is, but that was my experience as well. My cilantro didn’t get very big before it bolted. From the comment left above, it seems that you might have more luck growing cilantro in the spring and fall, and/or planting it in a partially-shaded area. One year I used two pieces 1/2″ pvc from corner to corner (it created an X over my box) and covered it with a thin piece of cloth. I think I used eyelet. Anyway, it gave those veggies some good shade for the hottest part of the day, but allowed direct sun in the morning and evening. My lettuce was FANTASTIC! I think this would probably help to keep cilantro growing and happy in the hotter months when tomatoes are producing! This is my first year trying to grow cilantro and it doesn’t seem to be going well. It seems that the cilantro I bought from the store and planted just seems to be going to seed and I didn’t get to use any of it. I love cilantro in Salsa. Is there a way get the cilantro to be ready to havest at the same time as the tomatoes? I also started seedlings inside that I transplanted outside. They seem to be doing well now but I am afraid they are going to go to seed really fast too before I can use them. Any advice? Just sharing what my experience has been with cilantro. Cilantro is a cold weather crop. At this very moment (Orange group) my cilantro is starting to bolt so I need to harvest. My spring planting if I buy a plant has never grown much and bolted quickly. I have always been disapointed. Last year I let it go to seed in the spring. I stripped the seeds and put into a baggie. I sprinkled a few back into the squares they came out of and shook the plant in my path, etc. OH MY! I never had to plant the seeds. In the fall I had the best cilantro that lasted all winter actually and grew very heavily this spring. So now I know the secret for awesome cilantro for my area. I have grown chives in my SFG for the past 3 years, and I love it. They just get better every year. My mother in law gave me a start 3 years ago and they just took off. I recommend doing chives for sure. I really like the idea of doing garlic, I hadn’t thought of that one before. Thanks! I just found your blog. Thanks for all the info. We just planted our first square foot garden and it’s going great.